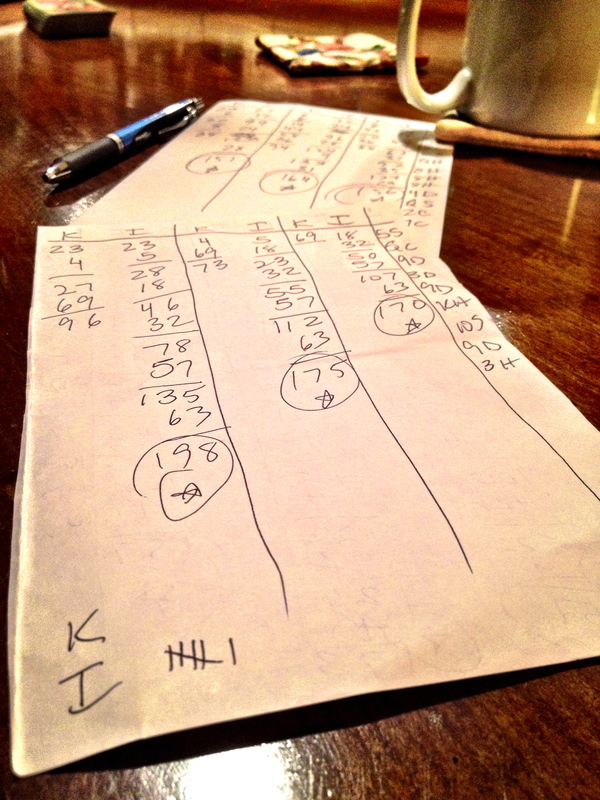 And you thought yesterday’s picture of meatloaf in the oven was un-blog-worthy… how about gin rummy scoresheets? After four days of gin rummy with my mom (between store runs, a few meals out, beach walks and World Series games) I find myself even further behind than what you see on the scoresheet above (which is two days old). The current score, after some 49 hands: I’ve won one game, my mom’s won eleven (a game is made up of many hands). “I” trouncing “K”has been the trend for at least six months. I am starting to conclude her winning streak is not attributable to luck. I have one more day to turn this around.